AT-076 is a so-called opioid "pan" antagonist and is the first reasonably balanced antagonist known of all four opioid receptor types. 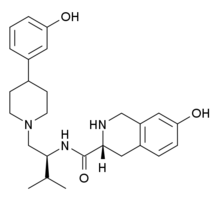 It acts as a silent antagonist of all four of the opioid receptors, behaving as a competitive antagonist of the μ-opioid receptor (Ki = 1.67 nM) and δ-opioid receptor (Ki = 19.6 nM) and as a noncompetitive antagonist of the κ-opioid receptor (Ki = 1.14 nM) and nociceptin receptor (Ki = 1.75 nM). AT-076 was derived from the selective κ-opioid receptor antagonist JDTic via removal of the 3,4-dimethyl group of the trans-(3R,4R)-dimethyl-4-(3-hydroxyphenyl)piperidine antagonist scaffold, which increased affinity for the nociceptin receptor by 10-fold and for the μ- and δ-opioid receptors by 3-6-fold. 1 2 3 Zaveri NT, Journigan VB, Polgar WE (2015). "Discovery of the First Small-Molecule Opioid Pan Antagonist with Nanomolar Affinity at Mu, Delta, Kappa, and Nociceptin Opioid Receptors". ACS Chem Neurosci. 6: 646–57. doi:10.1021/cn500367b. PMC 4401318 . PMID 25635572.